Nebula needs all of you... But only one will win! Rebuild Nebula, the valley invaded by mists! To do this, players will have to develop operations, transport network and buildings. Each building will bring not only points, but also benefits to its builder. But a single player will not be able to achieve all his objectives: Via Nebula is a "cooperative" game. We will have to work together to build roads and the most lucrative resources. The resources are available to all players, but the buildings are only accessible to one player: the one who will hasten to start the work! In the end, only one player will win. Plan, build and be smarter than others! Cooperation: cooperate to prevail over others! 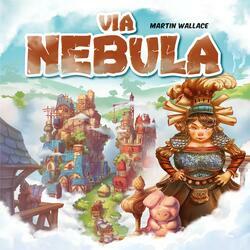 Martin Wallace's latest game: original while remaining classic! Illustrations and an atmosphere for families and experienced players.